Kirsten Dunst, contracted to do three Spider-Man movies as Mary Jane Watson, said she might be interested in doing a fourth. Interviewed by Robin Roberts during ABC's Good Morning America on Wednesday, Dunst at first seemed reluctant when asked about her Spider-Man future. "Unless they pay me exorbitant amounts of money," she said, laughing. Asked what could convince her to return, Dunst said, "I mean, if everyone came back, then probably. I doubt (they'd all come back), but I don't know, maybe everyone would. I would ... I would if everyone came back and if there was a story to tell." "Because it's all about the story," said Roberts, semi-sarcastically. "It is!" Dunst said. "That's why I did the first one." Dunst, who was promoting her new film Elizabethtown, said she starts work on Spider-Man 3 in January. After an announcement of a flip book by editor-in-chief Jim Lauchlin at Wizard World Boston, Top Cow Production on Wednesday provided details for its plans for City of Heroes #6. The issue, in stores on Wednesday, includes a bonus six-page back-up story, "City of Villains." spotlighting the new game from NCsoft and Cryptic Sutdios. The City of Villains is written by the game's senior designer, Sean Michael Fish, with artwork by James Raiz. It gives the player and the reader a peek at what is in store for them, as City of Villains takes off from some of the most dangerous and feared villains from City of Heroes universe. T The massive multiplayer online game itself will be available Oct. 31. Said Mclauchlin, "It's great seeing someone so involved from the ground floor of both City of Heroes and City of Villains, tell the story. We're literally seeing it from the eyes of the creator". The lead story is written by Troy Hickman, with art by Wilson Tortosa and a cover by Rudolfo Migliari. For covers and four-page previews of Marvel Comics titles arriving in stores on Oct. 19, CLICK HERE. Titles include Daredevil vs. Punisher #5 and Runaways #9. For covers and six-page previews of Marvel Comics titles arriving in stores on Oct. 19, CLICK HERE. Titles include She-Hulk #1 and X-Men and Power Pack #1. For covers and four-page previews of DC Comics titles arriving in stores on Oct. 19, CLICK HERE. Titles include Seven Soldiers: Klarion the Witch Boy #4, Captain Atom: Armageddon #1, Batman: Gotham Knights #70 and Batman: Journey in Knight #3. Moonstone Books has released its solicitations for February. The WB has released two more images of the "Aqua" episode of Smallville scheduled to air on Oct. 20. The images features Tom Welling as Clark Kent and James Marsters as Professor Fine/Brainiac. "Lana (Kristin Kreuk) decides to enroll at Metropolis University at the last minute and is forced to join a sorority to find housing at such a late date. However, her new sorority sisters offer her more than a place to crash after they turn her into a vampire and instruct her to kill Clark (Tom Welling). Meanwhile, Chloe (Allison Mack) applies for an internship at the Daily Planet, but the newspaper's formidable editor (guest star Carrie Fisher) may be more then she can handle." Steven S. DeKnight wrote the episode, which was directed by Jeannot Szwarc. * Adam West, television's Batman, and Lou Ferrigno, television's Incredible Hulk, guest star as themselves in "Shear Torture," the Monday, Oct. 24 episode of CBS' The King of Queens. In the episode, after convincing Lou Ferrigno to accompany him to the annual Sci-Fi convention, Spence (played by Patton Oswalt) spots Adam West in the subway and figures Batman would be a bigger coup than the Incredible Hulk. But Spence's plan unravels when he realizes that West and Ferrigno are old buddies and have caught on to his super-hero double-dipping. To the left is the package back art for Warner Bros.' upcoming The Flash: The Complete Series DVD. Click on the thumbnail for a larger image. * Jack Nicholson will talk about playing The Joker in 1989's Batman on Tuesday's episode of the syndicated Extra television series. * Marvel 1602, by Neil Gaiman, Andy Kubert and Richard Isanove, won the Quill Award for Graphic Novel. * Coming Thursday: Marvel news -- and much more!!! * Thursday, Oct. 6: IDW Publishing's soliciations for January and Smallville. 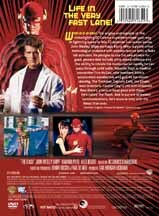 * Wednesday, Oct. 5: Batman Begins and The Flash on DVD, Marvel and DC Comics First Looks, Blade: Trinity on Starz and Neal Adams covers All Star Superman. * Tuesday, Oct. 4: Smallville's Aquaman, Marvel and DC First Looks, Superman Returns video game, New X-Men and Claypool for January. * Monday, Oct. 3: Top Cow and WildStorm/Vertigo panels at Wizard World Boston and Heroic Publishing's January solicitations. * Sunday, Oct. 2: Marvel and DC panels at Wizard World Boston and Heroic Publishing's January solicitations. * Saturday, Oct. 1: Ultimate Avengers Panel at Wizard World Boston, Smallville and Dark Horse First Looks. * Friday, Sept. 30: DC's Crisis Panel at Wizard World Boston, Scott Pilgrim preview and The Batman. * Thursday, Sept. 29: Scary Godmother on Cartoon Network, Blade TV, Justice #1 second printing, WildStorm vs. Aspen and First Looks. * Wednesday, Sept. 28: Cartoon Network for October, Marvel First Looks and Peter Cuneo talks Marvel movies. * Tuesday, Sept. 27: Mark Hamill voices The Trickster, X-Men 3 movie, The Batman, Aspen soliciations for December, DC and Image First Looks and Pete Woods exclusive to DC. * Monday, Sept. 26: The Batman, Teen Titans, Spawn: The Animation and Arcana's December solicitations. * Saturday, Sept. 24: Spider-Man Family, The Batman, Smallville and Claypool's jump-in issues. * Friday, Sept. 23: Justice League Unlimited's Supergirl, Image Comics' The Intimidators, Image Comics First Looks and Mike Mignola covers Death Jr.
* Thursday, Sept. 22: Image and Devil's Due solicitations for December. * Wednesday, Sept. 21: Marvel solicitations for December and Marvel First Looks. * Tuesday, Sept. 20: Marvel, DC and Image First Looks and new ShadowHawk artist. * Monday, Sept. 19: DC Comics' and Oni Press' solicitations for December.